One Hundred years ago, Hugh C. Wright from Shepody, Albert County, NB was busy fighting with the 26th New Brunswick battalion in trenches of Belgium. He was only 20 years old at the time. 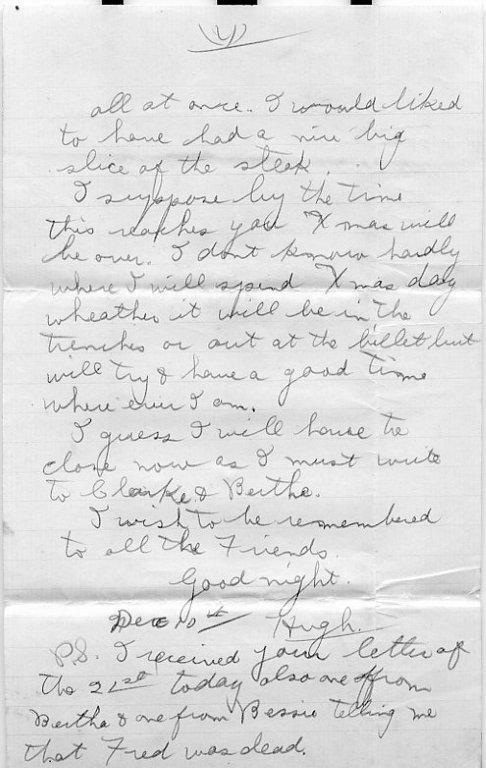 This was one of his letters home and was written December 9 & 10, 1915. A note on the Author - Hugh Carlisle Wright, from Hopewell,(Shepody), Albert County, NB, enlisted in the 26th Battalion on November 17, 1914. He was 19 years of age. He was in A Company, No. 1 Platoon while training in Saint John. He served in the 26th Battalion, 5th Infantry Brigade in Belgium and France and spent 17 months in the trenches. In February 1917, he transferred to the 4th Siege Battery, 2nd Brigade CGA and was a gunner for the remainder of the war. He was discharged in May 10, 1919...on his birthday! 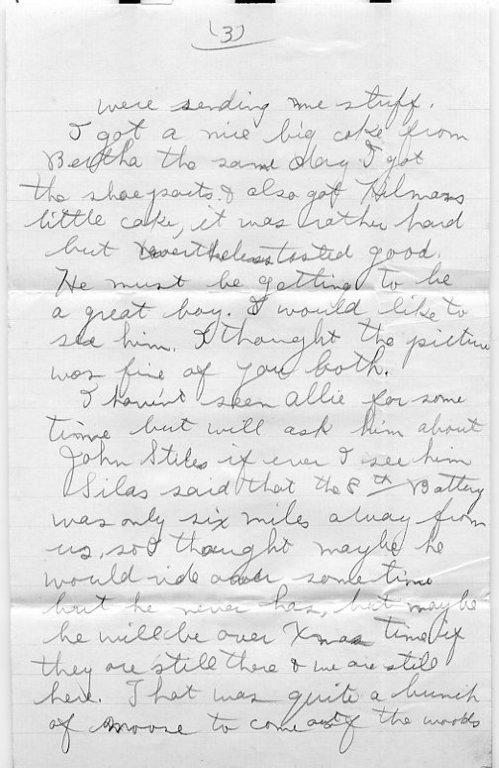 Hugh's letters are addressed … “Dear Father” because his mother died when he was only 7 years old. Harvey and Clarke were Hugh's older brothers. His brother Clarke enlisted in October 1915, arriving in England with CEF April 1916. Harvey didn't enlist but stayed home to run the family farm in Shepody. With many thanks to Hugh Wright's great niece, Dawne McLean who kindly submitted the letter. I received your letter of the 14th November day before yesterday and was very glad to get it. I got the parcels from home including the shoe pacts that day also. So you see they were not that long coming. They are fine, couldn’t have been a better fit. They are a nice easy thing on the feet and a good thing to walk in. I am wearing two pair of socks in them now, but I think I will be able to put another pair in later when they get stretched a little. I don’t know what better Christmas present a person could want than these. We changed our billet when we came out this time, so now we are staying in a large school house and it makes very comfortable quarters. We are right in a little town. Silas got his foot burned by a rubber sheet which caught on fire and melted and ran down onto his foot, so he is laid up somewhere and I have never been able to find where he is so have not seen him for some time, but I guess he is not hurt very bad. I have not seen Clyde for nearly three weeks, but I guess he is alright. The rest of us are fine. You spoke about being troubled to get to sleep, it is not that way with me. I can sleep most any place that I get a chance to now. I don’t think I will want anything for a while anyway. I had a few lines from Harvey and he said a lot of people were sending me stuff. I got a nice big cake from Bertha the same day I got the shoe pacts and I also got Hillman’s little cake. It was rather hard, but nevertheless tasted good. He must be getting to be a great boy. I would like to see him. I thought the picture was fine of you both. I haven’t seen Allie for some time, but will ask him about John Stiles if ever I see him. Silas said that the 8th Battery was only six miles away from us, so I thought maybe he would ride over some time but he never has, but maybe he will over Christmas time, if they are still there and we are still here. That was quite a bunch of moose to come out of the woods all at once. I would like to have had a nice big slice of the steak. I suppose by the time this reaches you Xmas will be all over. I don’t know hardly where I will spend Xmas Day, whether it will be in the trenches or out at the billet but I will try to have a good time wherever I am. I guess I will have to close now as I must write to Clarke and Bertha. P.S. 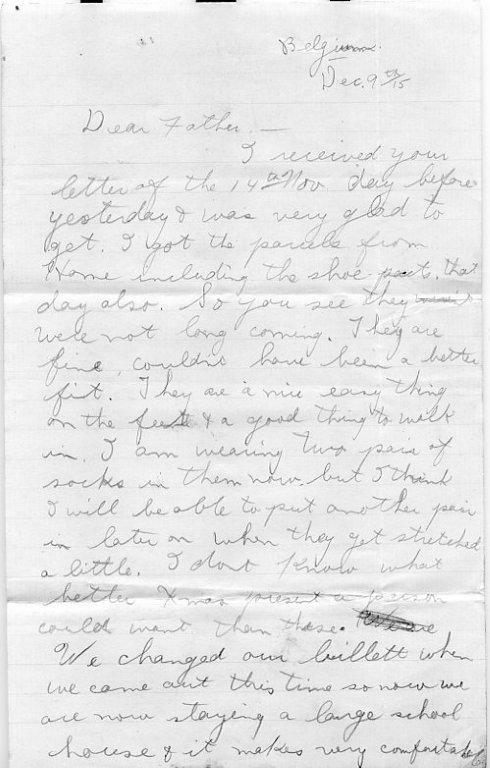 I received your letter of the 21st today, also one from Bertha and one from Bessie telling me that Fred was dead. I suppose he is better off for he must have suffered a good deal. I also got a nice long letter from Bessie Starratt. Hugh was one of the hundreds of Albert County men who volunteered for the Canadian Expeditionary Force (CEF), the majority joining the New Brunswick 26th Battalion. It was because of their sacrifices that Albert County was awarded the 77mm field cannon which sits in the square in Hopewell Cape. The museum is in process of restoring this cannon to help preserve their stories. If you have not done so, please donate to the Victory Cannon Campaign. You can donate online here.